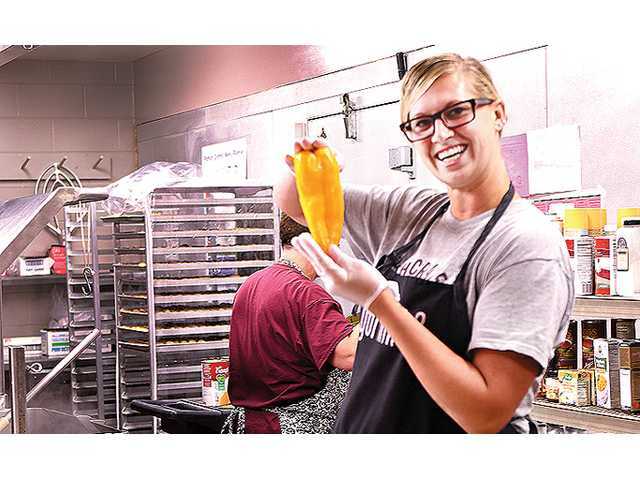 FOODSERVICE WORKER Nakita Kellogg holds a locally grown yellow bell pepper, which will be used in the school’s salad bar program. POSTED October 10, 2018 3:01 p.m.
NORTH CRAWFORD - The North Crawford foodservice program is making lots of innovative changes. The program has gained steadily in popularity in recent years with both students and staff. Especially popular has been the introduction of a ‘build your own’ salad bar, featuring a tasty selection of fresh vegetables. This year the school has even begun to source vegetables from local produce growers. October is National Farm to School Month, a national celebration of food education, school gardens and lunch trays filled with healthy, local ingredients. The school is sourcing fresh produce from Driftless Organics and Circadian Organics, and apples from Sunrise Orchard. Purchases from these local producers include green, red and yellow peppers, beets, onions and carrots from Driftless; tomatoes, cherry tomatoes, green and red peppers, onions and cucumbers from Circadian; and apples from Sunrise. Boland said she thinks that it’s good to keep a portion of their foodservice purchases local. In 2017, two students conducted a survey of student and staff satisfaction with the school’s foodservice program. Overall, the results showed that the students were happy with the program and would like to see more variety in what is offered. Head cook Janet Pittsley explained that the school serves about 12 to 15 pounds of lettuce per day, and the ‘build your own’ format with the salad bar is very popular. Boland explained that one of the keys to continuous improvement in the programs offerings is the open channel of communication and feedback they’ve created with the students. Pittsley said that among the programs most popular menu items are homemade chicken and gravy served over mashed potatoes, the salad bar, a popcorn chicken bar and nachos. New this year, the school has obtained a ‘Chef Culinary Demonstration’ grant. This grant will allow a chef associated with the Wisconsin Department of Public Instruction (DPI) to come into the school, prepare a menu item for the children, and then allow them to taste the dish. The two culinary demonstrations will be provided to students in a K-2 group, and a grade 3-5 group on Tuesday, Nov. 6. One group will get to try a ‘Tropical Bean Salsa,’ made with black beans, mango, red bell pepper, cilantro and lime juice. The other group will taste a ‘Rainbow Carrot Crunch,’ made with carrots of different colors, spinach and raisins, with a dressing made of orange juice, cider vinegar, sugar and vegetable oil. As if a basic hot bar and salad bar, growing in popularity, isn’t exciting enough, the program also has some other special events planned. In addition, the school will offer a family-style sit down meal for elementary students; a family breakfast for students and a family member; a chili tasting event in November; a ‘restaurant-style’ event, where high school students order off a menu and are served by their teachers; and a school-wide cookout near the end of the school year.